We proudly present to you, our fine Gender and Goddess Jewellery, symbols of our great traditions and diverse communities. Celebrate and reconnect with the Goddess Within through these empowering designs. 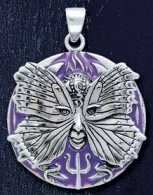 A beautiful Crone, 'Goddess of Maturity' pendant, slender feel, detailed on back showing cloak and hood. The Crone is a woman in the second half of life, at the peak of her power. Made by Jane Iris Designs - USA. The feminine form and spirit have been deeply celebrated throughout time. 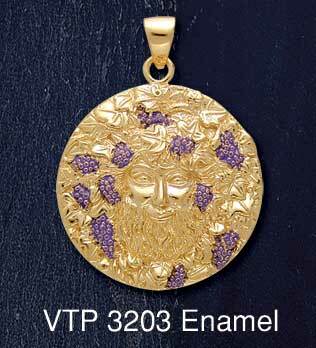 The giver of life, the Goddess is also associated with Venus and said to assist fertility. Top has a fixed Silver Bail for Chain. 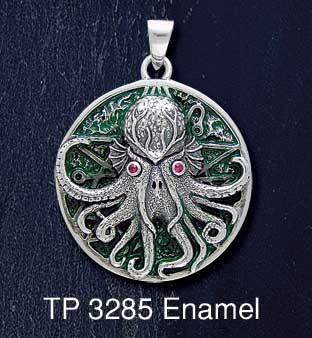 Suitable as a pendant, for a charm bracelet, add to ritual tools. Double sided pendant showing detail on the back. 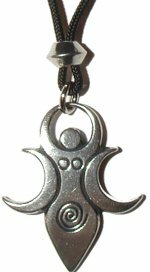 Inner focus pendant, reconnect with your inner goddess. Features a 1mm central stone. Choose from a faceted Garnet stone or a 1mm cabachon Moonstone. 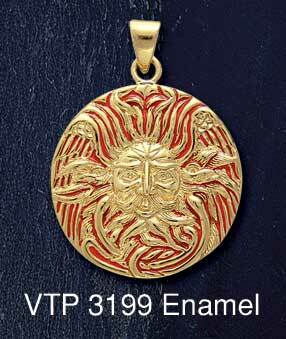 The back of this pendant hides a fixed Silver Bail for a chain. Note: Image example shows faceted Blue Topaz stone. 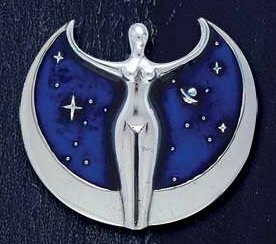 A beautiful pendant celebrating the divine feminine. The Goddess holds your chosen stone - available with 4mm dia Amethyst Cabachon stone or 5mm Rainbow Stone. Note: Image example shows faceted Garnet stone. shows a brilliant silver lustre. Regeneration and the Giver of Life - This image of the Nile Goddess appeared around 4000 b.c. 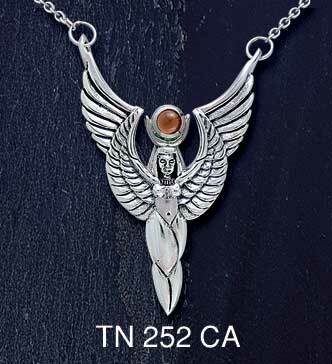 She symbolises fertility, has a bird like face and wing like arms. 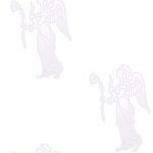 She symbolises regeneration, as she is a blend of bird, woman and deity. Her well rounded lower half represents the cosmic or primal egg. The cosmic egg was said to have been the basis of all cosmic matter from which the universe is formed. 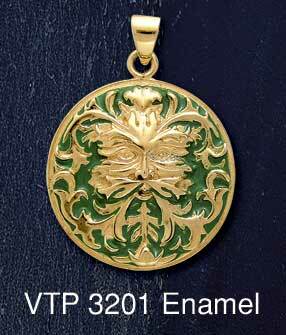 This pendant is a solid piece and has a very smooth surface to touch. 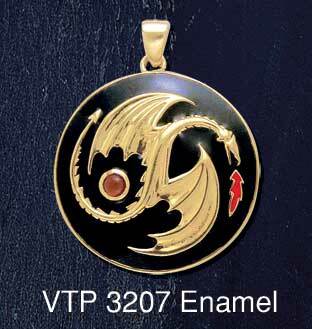 This pendant is Double Sided comes on black cord. 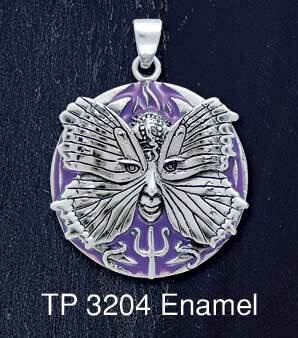 This beautiful Psyche Goddess Medallion Pendant has a raised 3D look. 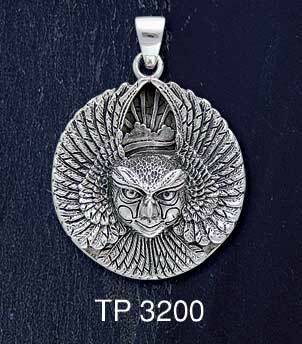 Psyche's face and wings are raised on a 1mm thick sterling silver medallion circular disc. 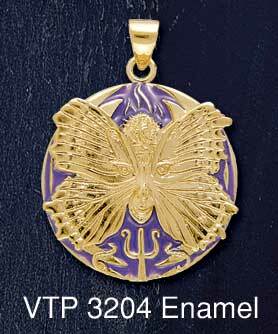 The medallion base on this pendant features purple enamel. 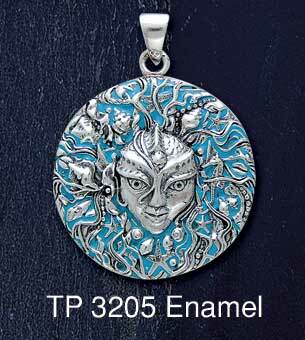 Created by Oberon Zell Ravenheart, Psyche Spirit Goddess is also available as an Elemental Plaque. Click for more......Oberon Zell-Ravenheart's Millenial Gaia Statue and Elemental Plaques. This representation of The Star Goddess ~her lunar cloak drawing the Veil of Night~ is artist Oberon Zell�s personal tribute to Doreen Valiente, author of the beloved �Charge of the Star Goddess�. This pendant has beautifully smooth, shimmering lines. 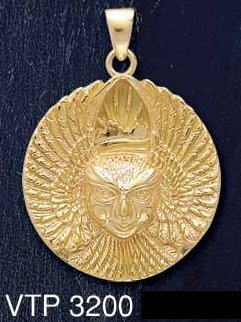 The bail is hidden behind the pendant. 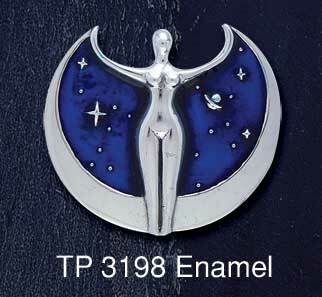 Created by Oberon Zell Ravenheart, Astra, The Star Goddess is also available as an Elemental Plaque. Click for more......Oberon Zell-Ravenheart's Millenial Gaia Statue and Elemental Plaques. This interwoven pentacle's curved lines are reminiscent of the softly curved lines of the earth, where straight lines are rare. 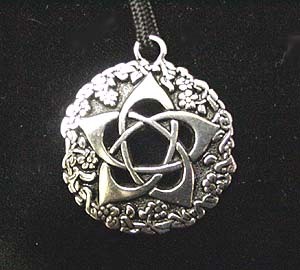 Flower petals form the five points of the Pentacle. This delicate talisman combines the protective power of the five-pointed star with open flowers of the Goddess. It is worn in respect and honor to the Earth Mother. This beautiful pentacle calls upon the life giving forces of the Goddess while conveying upon the bearer the powerful protection ascribed to this symbol by so many religions and mystical traditions. A sturdy piece, this pewter pendant is Double Sided, has a fixed bail and comes on Black Cord. Rainbow Colours - Rainbows have been used since ancient times in many cultures and symbolises Freedom! The Rainbow Flag has become one of the most widely used and recognised symbols of the Gay Pride movement. It represents the diversity yet unity of Gays and Lesbians universally. Each colour represents a different aspect of Gay and Lesbian Life : Red for life, Orange for healing, Yellow for the sun, Green for nature, Blue for harmony, Purple for spirit. Pink Triangle - The pink Triangle is easily one of the more popular and widely-recognized symbols for the Gay community. The pink Triangle is rooted in World War II times and reminds us of the tragedies of that era. It draws attention to the oppression and persecution - then and now. Gender Symbols - The pointed Mars symbol represents the male gender. It is the astrological symbol of the planet Mars, alchemical symbol of iron and symbol of the Greek god Ares and the Roman god Mars. The Venus symbol with the cross represents the female. It is the astrological symbol of the planet Venus, Double interlocking male symbols have been used by gay men. Double interlocking female symbols have often been used to denote lesbianism. Interlinked male gender symbols represent the unity and strength of gay men. This symbol on its own, is the astrological symbol of the planet Mars, alchemical symbol of iron, gender symbol for men and symbol of the Greek god Ares and the Roman god Mars. It also originally represented the shield and spear of Mars. The addition of the Triangle, set with Rainbow stone is associated with the Gay community. The Rainbow colours symbolise freedom and is a recognised symbol of the Gay Pride movement. Each colour represents a different aspect of Gay and Lesbian Life. Red for Life, Orange for Healing, Yellow for the Sun, Green for Nature, Blue for Harmony, Purple for Spirit. Represents the feminine, fertility, beauty and love. It is also the astrological symbol of planet Venus, the Roman goddess Venus or the Greek goddess Aphrodite, alchemical symbol of copper and gender symbol for female. 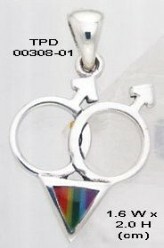 The addition of the Triangle symbol, set with Rainbow stone is associated with the Gay community. I am Goddess of the Moon and Goddess of the Hunt. I am the protectress of all women and of virgin girls. I am called upon to ease the pain of childbirth. I am strong and swift and I run in the woods, wild and free with a spirit for adventure. Lean and muscular, beautifully athletic, the perpetual tomboy; this is the image of the Goddess Artemis. Artemis is also a triple-moon Goddess known as Luna, in the heavens; Artemis on Earth; and Hecate in the underworld. Her strong association with the moon and lunar cycles, makes Artemis the goddess of female secrets. Be warned, as her retaliation is quick and her arrow never misses. Explore the Moon Goddess in all phases of her glory and worship the Moon Goddess 'Artemis' within you! I am the Great Mother - reach out to me in your times of sorrow, your times of need, your times of loneliness. I have experienced great pain and relentless grief. I am the Queen, the Divine one, the only one. I am the maker of Kings. I am the Lady of Joy. I am the Moon Goddess, the Star Goddess and Queen of the Underworld. I emerged out of the primeval abyss of water and from my energy all life was born. Call out to me at twilight. I will arise from the sea with the scent of jasmine, sandlewood, rosemary and lotus blossoms. My tears, my passion and my joy are for you. I am the White Goddess - Isis! Hand Crafted Original Design by ShadowSmith - Australia. large cabochon�cut Garnet stone on Sterling Silver chain. Featuring entwined silver border around raised Garnet setting. Chain is attached to tips of crescent moons. 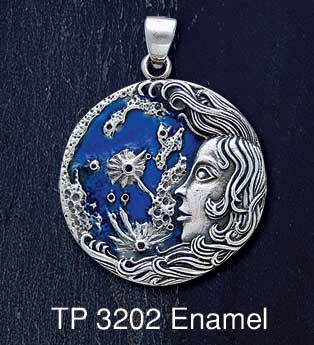 Make your own Head Wear with this beautiful pendant. large cabochon Amethyst stone is available. Featuring entwined bright silver border around raised stone setting. ready to add chain or leather cord. Crescent Moon pendant. Features large cabochon�cut Amethyst stone between Silver crescent moons. Chain is attached to tips of the Crescent Moon. 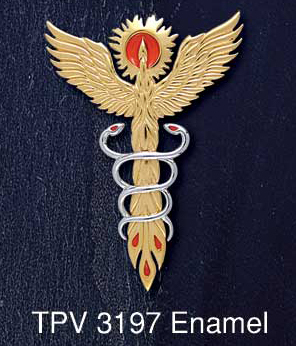 Designed to be worn on the forehead above the eyes. Can be also worn as a necklace.